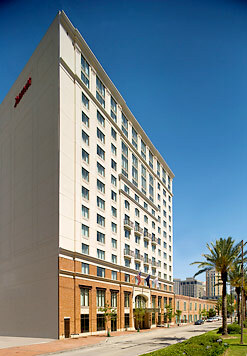 New Orleans and legendary cuisine go hand-in-hand with New Orleans Marriott at the Convention Center Escape! Dining Package offered for a limited time with prices starting at $114 per night. Escape to New Orleans for a delectable two-night dining getaway that is sure to inspire every taste bud. It's the perfect way to celebrate the tastes of the season with someone special. Located on the hotel's lobby level, Wolfe's Restaurant in New Orleans, LA is led by renowned New Orleans' chef, Tom Wolfe. This spectacular hotel restaurant serves up Chef Wolfe's take on contemporary Creole cuisine influenced by various different nationalities. Using the foundation of traditional New Orleans cooking, Chef Wolfe has created a true melting pot of culinary inspiration. Highlighted by a casually inviting, low-key ambiance and crisp service, Wolfe's In the Warehouse is a New Orleans hidden treasure. Housed in a former cotton mill from the 1800's, New Orleans Marriott at the Convention Center seamless blends classic antiques with modern amenities and chic décor. With 320 luxury New Orleans hotel rooms and 11 spacious suites, these premier hotel accommodations set the standard for sophisticated travel. Every room boasts deluxe new bedding including down comforters, custom duvets and cotton-rich linens, plush bathrobes and state-of-the-art flat screen TVs. Perfectly positioned within walking distance to the famous French Quarter and Harrah's Casino, this Big Easy New Orleans, LA riverfront hotel is also centered among the legendary restaurants and boutiques that New Orleans is known for. Discover all that the Crescent City has to offer and make it a weekend to remember in the Big Easy with the New Orleans Marriott at the Convention Center's new Escape! Dining Package. *Be sure that the promotional code D60 appears in the Corporate/ Promotional code box when making your online reservations, or call 1-800-305-6342 in the US and ask for promotional code D60. **Minimum two-night stay is required. Valid seven days a week through 12/31/07. Based on double occupancy. Limited number of rooms are available for this promotion. Tax is additional. Offer does not apply to groups of 10 or more rooms. Offer cannot be combined with any other promotions. Blackout dates may apply. Advance reservations required. Other restrictions may apply. Rates are per room, per night and based on availability at the time of reservation.